The first edition of the Jobs Rated Almanac, upon which the Jobs Rated report draws its data, was published three decades ago and much about the job market has changed over the past thirty years. Back then, the unemployment rate was 5.3%. It has since dropped to 3.9%, causing a tightening in the labor market, which is a boon to job seekers but hurts businesses that are trying to recruit qualified talent. Today, the unemployment rate for college grads aged 25 and older is just 2.2%, according to Bankrate.com statistics. This is good news for the class of 2018. For those who graduated thirty years ago, the unemployment rate was 2.2 times higher. Outlook and salary have also risen. For example, mathematician, which has been rated a “best job” for three decades, earned about $27,000 when the Jobs Rated report was first established. They now earn a median annual salary $81,950 with a growth outlook of 33%. On the other hand, watch repairer, a profession that no longer appears on the Jobs Rated report, earns just $39,530 annually with a 3.5% growth outlook. Since the Jobs Rated report was first published, America experienced three recessions, each stemming from different sectors of the employment ecosystem. Rising energy costs in 1990 led to a recession that persisted into 1991; the burgeoning tech industry’s crash at the turn of the millennium led to a recession in 2001; and the worst economic crisis since the Great Depression, last decade’s Great Recession, which stemmed from the burst of a housing bubble and impending shockwaves reverberating through the national banking sector. Job markets have changed coming out of each of these turbulent times, an ongoing trend we see in the 2018 CareerCast.com Jobs Rated report. This year’s report features 20 new careers with high growth outlook, in a variety of sectors. Growth industries like medicine, software, and information security are forecasted to grow by more than 30% each in the next eight years, according to the Bureau of Labor Statistics. Informational technology is an obvious driver of many of the changes sweeping the employment landscape – though that’s no different than 100 years ago, say nothing of 30. In 1989, the internet existed – if you worked in government or were among the very limited subculture that knew how to get access. A proliferation of internet access radically changed society, and as a result, the job market. Many of the booming job prospects tracked in the Jobs Rated report are directly tied to that proliferation, and cover a variety of sectors. What’s more, 24-7 access to the internet with the ubiquity of smart phones has given rise to careers like Software Application Developer. While Computer Programmer appeared on the first Jobs Rated report – and remains today – a burgeoning field designed for programming games, news providers, streaming television that would have been inconceivable 30 years ago. 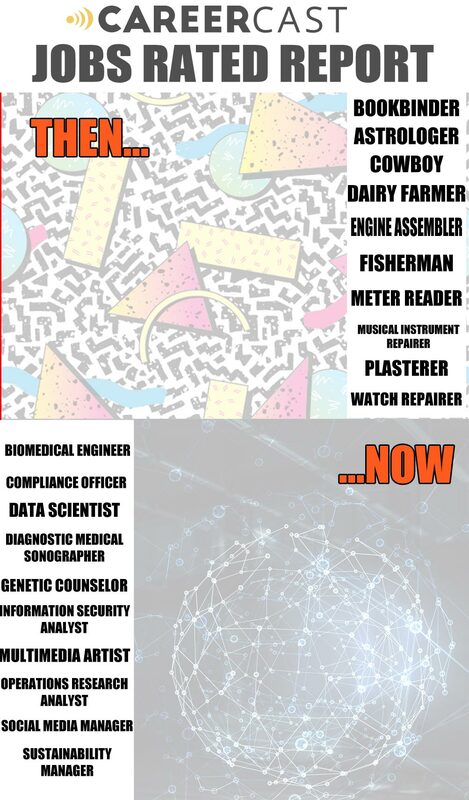 Tech-led change has also impacted other careers. The Jobs Rated report updates each year to track new, burgeoning fields, and removes archaic lines of work. Because our phones have clocks, watches are more luxury than necessity in 2018. As a result, Watch Repairer is long gone from our ranking of 220 jobs. Job market trends are felt in other, everyday facets of life – like where we live. The 1990 U.S. Census, conducted just one year after the first Jobs Rated report, ranked Detroit as the seventh-most populace city in the United States. By 2010, Detroit fell from the top 10. That downturn in population is a direct result of the loss of automobile manufacturing jobs. While careers in manufacturing still appear in the Jobs Rated report, Engine Assembler is gone. And, while a manufacturing hub such as Detroit has seen a dip in population commensurate with job-market change, tech-hub San Jose boomed, reaching the top 10 of metropolitan rankings for the first time in the 2010 Census. The next wave of cultural changes ongoing as a result of the employment landscape will be more easily seen with the benefit of hindsight. Old careers can make a comeback as a result of these cultural shifts. For example, the younger generation of employee – the Millennial generation – is shirking the Baby Boom and Generation X’s choice to live in suburbs whenever possible. Living and working in more densely populated regions changes the way their modes of transportation, and a career like Bicycle Repairer sees a projected 29% growth and return to the Jobs Rated report after many years away. Below is a historical look at some of the jobs that are no longer ranked by the Jobs Rated report, along with professions that have been added in recent years.